Sunscreen is supposed to protect our skin, but not all of them truly prevent damage from UV rays--some sunscreens even have ingredients that can cause other issues, like hormone and fertility problems over time. Do you know what ingredients are in your sunscreen? Make sure that you're using a sunscreen that actually protects you from ultraviolet rays, keeps you healthy, and helps preserve our oceans. Every year since 2007, the EWG releases a sunscreen guide based on their evaluation of about 650 beach and sport sunscreens. This year, they found that 2/3 of the sunscreens evaluated still contained troublesome ingredients and offered inferior sun protection. We've summarized their main findings for you here. There is little scientific evidence that suggests that sunscreen alone reduces the risk of cancer, particularly melanoma, the deadliest type of skin cancer. Melanoma rates have tripled in the past three decades. It's important that you fully understand what exactly sunscreen does, and how to keep yourself safe from ultraviolet rays otherwise. Higher SPF, or sunburn protection factor, doesn't necessarily mean greater protection from UV-related skin damage, especially UVA. In 2011, the FDA determined that SPF claims were "inherently misleading" and proposed to join other industrialized nations in capping the SPF values at 50. The agency never finalized this rule, and you can still see many sunscreens marketed at high SPF values. Most sunscreens don't sufficiently protect your skin from the sun's ultraviolet (UV) rays. 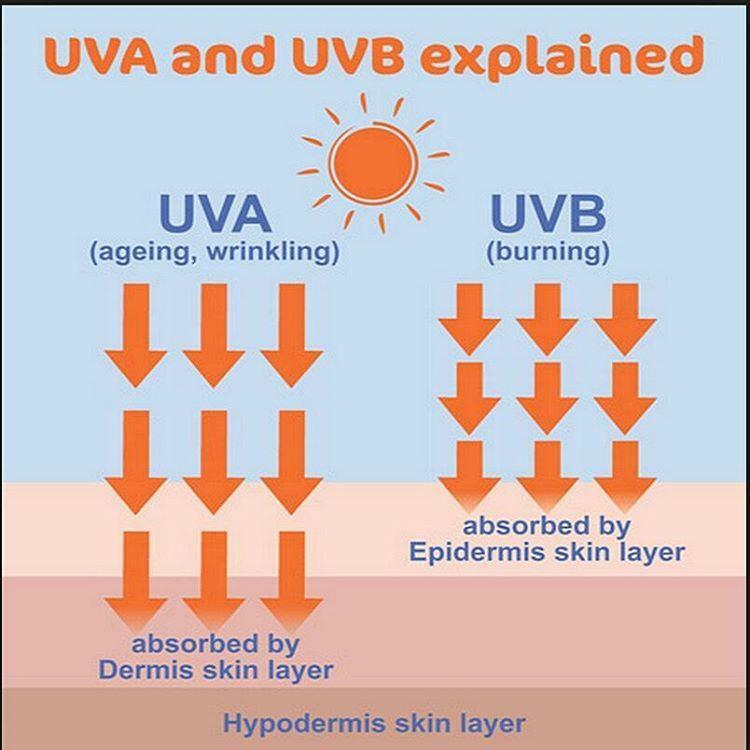 UVB rays are the primary cause of sunburns and pre-cancerous DNA mutations, and UVA rays cause tanning and subtler damage. UVB rays are high-energy but only makes up 3-5% of the radiation hitting the earth. UVA rays have less energy but penetrate deeper into skin tissue and are most responsible for generating free radicals that damage DNA and skin cells. This can contribute to skin cancer, accelerate skin aging, suppress the immune system and can contribute to the development of melanoma. SPF prevents sunburn and can block UVB rays, but does not necessarily prevent or reduce the damage caused by UVA rays. Sunscreens in Europe have higher UVA protection than sunscreens produced in the US, due to the FDA's limitation on ingredients. Only two of the FDA approved ingredients filter UVA rays, while Europe has seven ingredients that can do so. "Stanford University dermatologists who reviewed CDC national survey data concluded that people who relied solely on sunscreens for sun protection had more sunburns than people who reported infrequent sunscreen use but wore hats and clothing to shield themselves from the sun (Linos 2011). In Sweden, increased use of sunscreen by children was linked to more sunburns (Rodvall 2010). Several other studies of real-world sunscreen use found that people who use sunscreen for skin protection during periods of intense UV exposure had more sunburns (Koster 2010, Autier 2007)." Staying in the shade and covering skin with clothing is suggested as an effective way to protect from skin damage. Although sunscreen-use can mitigate damage, it does not thoroughly protect your skin, especially during long periods under the sun. The EWG and FDA have raised concerns with spray-on sunscreen because it poses an inhalation risk and does not coat evenly on the skin to protect it. However, the FDA has not taken action to ban sprays yet. Vitamin D is critical for your health-- it helps to reduce your risk of disease, and also is essential for absorption of calcium and bone growth. Vitamin D deficiency has been linked to breast cancer, colon cancer, prostate cancer, heart disease, depression, weight gain, and more. Unfortunately, about "8 percent of the population has a serious vitamin D deficiency, and another 25 percent is considered at risk of a deficiency (CDC 2011)." Vitamin D from the sun comes from UVB rays, which most sunscreens block out. You can only absorb Vitamin D when you are not wearing sunscreen, and only at certain times of the day depending on your location. You can use the app Dminder to see when you can absorb Vitamin D, and a safe amount of time that you can stay in the sun while minimizing skin damage. It is likely that you still have low Vitamin D levels even if you do get sun and eat foods with Vitamin D. You may want to have your Vitamin D levels checked through a blood test. You can check with Dr. Johnson if you may need to start Vitamin D supplements. These ingredients are still common in many sunscreens, and are legally allowed in the US despite potential health risks. This ingredient is used in most sunscreens and is an allergen and hormone disruptor. "The Centers for Disease Control and Prevention have found oxybenzone routinely in more than 96 percent of the American population. 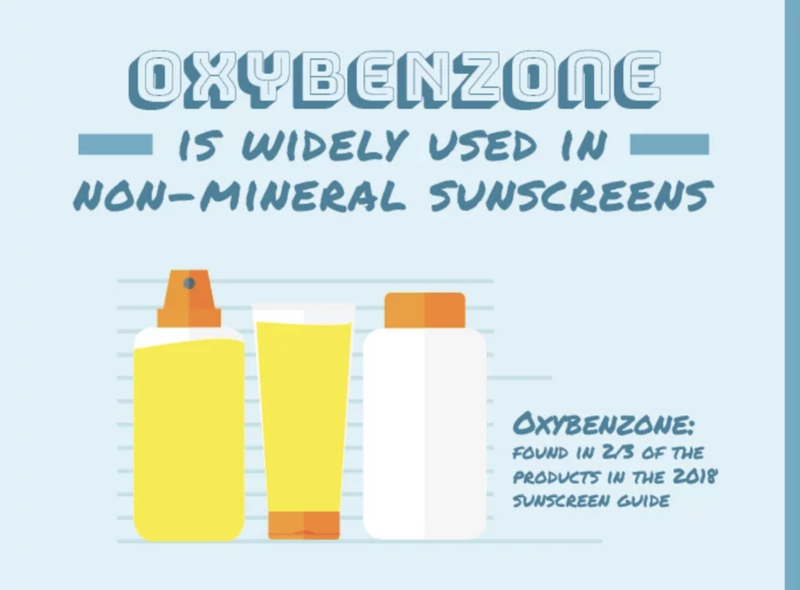 Study participants who reported using sunscreen had higher oxybenzone exposures (Zamoiski 2015). Margaret Schlumpf of the University of Zurich detected oxybenzone and four other sunscreen filters in Swiss women’s breast milk, indicating that the developing fetus and newborns may be exposed to these substances (Schlumpf 2008, Schlumpf 2010). She detected at least one sunscreen chemical in 85 percent of milk samples." "The National Institutes of Health and The State University of New York, Albany, suggest a link between higher concentrations of benzophenones and poorer reproductive success in men seeking assistance at a fertility clinic. Men with greater exposures to benzophenone-2 and/or 4-hydroxyoxybenzone had poorer sperm quality (Louis 2015), and reported that it took longer for their partners to conceive (Buck-Louis 2014). Female exposures to oxybenzone and related chemicals have been linked to increased risk of endometriosis (Kunisue 2012)." Oxybenzone is also damaging to coral reefs-- it is toxic to coral and creates viral infections that can bleach coral and even result in coral death. It is estimated that up to 14,000 tons of sunscreen is deposited in the world's oceans each year. To protect its coral and marine life, Hawaii recently passed a bill to ban the sale of oxybenzone-containing sunscreen. Other names: retinyl acetate, retinyl linoleate and retinol. EWG found that this form of Vitamin A can harm skin. Government test data indicate that it may trigger development of skin tumors and lesions when used on skin in the presence of sunlight. Other governments warn that certain cosmetics may contribute to unsafe amounts of vitamin A, and recommend against using them. Methylisothiazolinone is a preservative and inactive ingredient in sunscreens. Inactive ingredients usually make up 50-70% of a sunscreen product. Methylisothiazolinone is known as a skin sensitizer, and in 2013, the American Contact Dermatitis Society named methylisothiazolinone its “allergen of the year”. "In a study published in 2014, researchers at Baylor University surveyed the ingredients in 152 children’s body care products labeled “hypoallergenic” and found methylisothiazolinone in 30 of them (Schlichte 2014)." Although it is still legal in the U.S., this ingredient is not allowed in European products. "In March 2015, the European Scientific Committee on Consumer Safety concluded that no concentration of the chemical could be considered safe in leave-on cosmetic products (EU SCCS 2014)." Want to read more about ingredients? Click here. Have a sunscreen that you really like? Check here to see if it is safe under EWG standards. Need to find a new sunscreen that is healthy and safe? Check this guide for recommendations. Two brands that we like are All Good and Badger. If you want to help ban oxybenzone from sunscreens, take a minute to sign this petition. One of the MAIN functions of the adrenal glands is to mount a response to stress by secreting cortisol and adrenaline hormones. 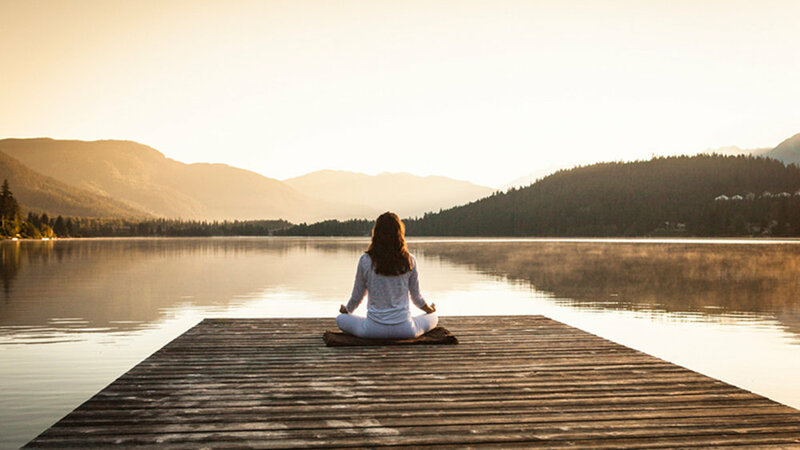 This is often referred to as you “fight or flight response,” which is a healthy and necessary response to help us appropriately manage those acute periods of stress. The issue arises when stress becomes prolonged, as this adaptive response becomes maladaptive. This may be one of the most commonly overlooked areas in healthcare. Just like anything else, too much of a “good thing” can be a bad thing. With the emergence of unrealistic social media-created ideals, the epidemic of excessive exercise and burnout is on the rise. Exercise is indeed a stress to the body, which causes a release of catecholamines and cortisol. A degree of stress through exercise is healthy and necessary for growth and adaptation; however, chronic over-exercise turns this anabolic activity into a catabolic one. Not only can over-exercise lead to muscle breakdown, but it can also wreak havoc on your endocrine and immune systems, leaving you victim to increased fatigue, decreased stress resilience, hormone imbalances, and lowered immune function. During a restful night of sleep, cortisol is at its lowest and your adrenal glands essentially get a rest. With a normal cortisol/melatonin rhythm, melatonin (your sleepy hormone) starts to make a sharp rise and cortisol (your awake hormone) takes a deep dip just before 9 pm. This 9 pm mark is thus the IDEAL time to start winding down for bed. This reverse of this pattern, where cortisol begins to spike and melatonin dips low occurs just before 6 am. The further your sleep pattern deviates from this innate cortisol/melatonin rhythm, the greater the distress on the health of the adrenal glands. Severe pain has a profound impact on the health of the adrenals. Severe pain, whether acute or chronic, is viewed as an acute stressor by the endocrine system. Initially, the increased demand on the adrenals causes a large rise in cortisol. Over time, however, the adrenal glands are unable to keep up with demand and cortisol often drops below the normal range. One of cortisol’s main roles is to keep blood sugar stable. It does so by taking blood sugar out of stores when blood glucose starts to drop below acceptable levels. With crash dieting, fasting, or insufficient nutrient intake, the demand for cortisol increases, which places an additional stress on the adrenal glands. Aim to get a minimum of 8 hours of sleep each night. Some individual’s recovering from adrenal fatigue may need more, so listen to your body! Each hour before midnight counts as double, so aim to get to bed by 9 pm! Set time limits on exercise. Exercise is healthy, right? Well, it can be a detriment to your health if you are consistently overdoing it. When recovering from adrenal fatigue, it is extremely important to keep exercise at a moderate level. I typically recommend patients to keep exercise to a maximum of 1 hour of moderate exercise (such as: light cardio, resistance training, and yoga). This is not the time to do intense spin classes, cross-fit, HIIT workouts, or Bikram yoga. Dial back your work commitments. For many individuals, work is a significant source of stress. This may especially be the case if you consider yourself “type A” or a people-pleaser. Make sure that you are not taking on more tasks than you can handle. Consistently working overtime, working in an emotionally toxic environment, working under high pressure of time or significance, and making long commutes can all contribute to burnout. It’s a good practice to pull out your contract and evaluate whether you are going above and beyond the job duties for which you were originally hired. The main goal of an adrenal reset diet is to use macronutrients (carbohydrates, fats, proteins) to promote a healthy cortisol/melatonin rhythm through blood sugar modulation. 1. We want cortisol around — but at the right time. Cortisol, your “stress hormone” gets a bad rap. In excess and for prolonged periods of time, cortisol can indeed be bad; however, cortisol has many IMPORTANT beneficial roles in our body including: blood sugar regulation, blood pressure regulation, anti-inflammatory actions, and energy! 2. Cortisol and Melatonin are in opposition. When Cortisol is high, melatonin is low. The reverse is also true. 3. Cortisol and Blood Sugar are in opposition. One of cortisol’s roles is to regulate blood sugar by taking sugar out of its storage form and putting it into the bloodstream when blood glucose is low. This means that when blood glucose is low, cortisol will rise in order to achieve this act. This is one reason why cortisol levels RISE after exercising. Breakfast: Breakfast should consist of a healthy protein, healthy fat, and good amount of vegetables with adequate fiber. This type of breakfast will keep morning cortisol high, as it should be. Lunch: Mid-day is the time where cortisol begins its decline. To maintain a relatively high level of cortisol, eat a lunch high in protein. If your body is already at a point of “adrenal fatigue,” it may not be able to meet these demands, and could result in some irritability. Alternatively, eat about ½ cup of carbohydrates to encourage a natural decline in cortisol. Dinner: It’s finally time to start dampening that cortisol response and stimulating melatonin production! This is accomplished with a healthy portion (about 1 cup) of carbohydrates. If your meal is too low in carbohydrates, more cortisol will be released to help balance blood sugar, which could prevent you from falling asleep! Snacks: Snacks are important, and don’t let anyone tell you otherwise. If you are in the stage of adrenal fatigue where your body is unable to mount an appropriate cortisol response, keeping your blood sugar stable can become quite difficult. For this reason, I usually recommend eating a high protein snack between meals, such as an Epic Bar, protein shake, or plain Kite Hill Greek yogurt! Avoid Stimulants: Such as coffee and energy drinks. If you need caffeine, I recommend drinking green tea, which also contains L-theanine, an amino acid that helps calm the mind by mimicking GABA. Eat Plenty of Sea Salt: Many individuals with adrenal fatigue will crave salt due to low aldosterone, another steroid hormone produced by the adrenals. Aldosterone’s main role is to help control blood pressure through the regulation of salt content within the body. With declining aldosterone, dehydration and lowered blood pressure ensues. Increasing your intake of sea salt and trace minerals is a good way to offset some of the symptoms of lethargy, headaches, lightheadedness, irregular heartbeat, and muscle weakness. · B Vitamins play a big role in the stress-response and can become depleted over time with chronic stress. · DHEA is not for everyone, and can have serious consequences if used inappropriately. However, DHEA, a pro-hormone to both testosterone and estrogen, is very helpful in those that have reached complete adrenal exhaustion, where DHEA has also begun to drop. · Phosphatidylserine reduces cortisol. This can be extremely helpful with a disrupted cortisol rhythm that is keeping you from sleeping! · Glandulars are the glands of other animals. Relying on the hormones of another animal’s adrenal glands is not a long-term solution, but can be taken to help get you through the day when you are not able to create sufficient amounts of your own adrenal hormones. This article was written by our Naturopathic Doctor, Dr. Ari Kasprowicz. Do you believe you may be suffering from Adrenal Fatigue? Make an appointment with Dr. Kasprowicz to get your adrenals tested today and have a plan created that is right for your individual state. Welcome to our wellness blog! Your source of information for leading a better, healthier, and more sustainable life.